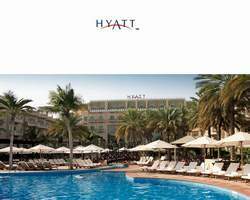 Grand Hyatt Hotel Muscat is located on the sandy beach of Shatti Al Qurm, overlooking the azure waters of the Gulf of Oman, Grand Hyatt Muscat is in the heart of the diplomatic and government district of Muscat in the Sultanate of Oman. Muscat is a city with many points of interest, from natural freshwater pools, parks and nature reserves to plenty of unspoilt, soft sandy beaches and an abundance of marine life. Enjoy a modern 42-sq.-metre room offering the latest technology but still reflecting the calm, traditional Omani style. Partial mountain, city or garden views from a spacious balcony complement pampering amenities, including one king bed with deluxe linens and plush feather duvet, marble bath with soaking tub, walk-in shower and bidet, and generous work area with high-speed Internet access. Partial views of the spectacular Gulf of Oman from a private balcony welcome you to a 42-sq.-metre room featuring contemporary decor with traditional Omani touches. Pampering amenities include king-size bed featuring the softest linens, ultra-plush pillows and feather duvet, generous work area with high-speed Internet access, daily newspaper, and marble bath with soaking tub, walk-in shower and bidet. Stunning views of the Hajar Mountains and Embassy district welcome you to a 42-sq.-metre room offering traditional Omani touches and king bed with plush duvet. Exclusive amenities include large work area with complimentary high-speed Internet access, and marble bath featuring soaking tub and walk-in shower. Includes access to a private lounge serving Continental breakfast, evening cocktails and hors d'oeuvres. Stunning views of the spectacular Gulf of Oman from a private balcony welcome you welcome you to a 42-sq.-metre room offering traditional Omani touches and king bed with plush duvet. Exclusive amenities include large work area with complimentary high-speed Internet access, and marble bath featuring soaking tub and walk-in shower. Includes access to a private lounge serving Continental breakfast, evening cocktails and hors d'oeuvres. Stunning gulf, mountain, garden or city views from a spacious balcony welcome you to an 84-sq.-metre suite offering traditional Omani touches. Exclusive amenities include living area with sofa, king bedroom, generous work area, complimentary high-speed Internet access, and marble bath with tub and walk-in shower. Includes access to a private lounge serving Continental breakfast, evening cocktails and hors d'oeuvres. Stunning gulf, mountain or city views from a spacious balcony welcome you to a 135-sq.-metre suite offering traditional Omani touches. Exclusive amenities include living and dining areas, work area with complimentary high-speed Internet access, marble bath with soaking tub and walk-in shower, and king bedroom. Includes access to a private lounge serving Continental breakfast, evening cocktails and hors d'oeuvres. Spectacular gulf or mountain views welcome you to a 280- to 311-sq.-metre two bedroom suite featuring extravagant decor and unique Omani touches, balcony, living/dining areas, kitchen and marble bath with jetted spa tub. Master suite features four-poster king bed with choice of king or twin beds in additional room. Includes complimentary high-speed Internet service and Club lounge access. Spectacular gulf views welcome you to a lavish 336-sq.-metre suite offering elegant living and dining areas, guest bath, kitchen and two bedrooms with plush king and twin beds. Pampering amenities include marble bath with jetted spa tub, sauna and shower, office, complimentary high-speed Internet access, butler service on request, and access to a lounge serving continental breakfast, evening cocktails and hors d'oeuvres. A wide selection of restaurants offering Arabian and global cuisines in comfortable and stylish surroundings. Please note that restaurant and bar timings are subject to change during the Holy Month of Ramadhan. Kindly click here for details during Ramadhan. Award-winning Tuscany is known to be the best Italian restaurant in Muscat and not without reason. Excellent seasonal menus are created by Grand Hyatt Hotel Muscat Chef and their brigata. Serving breakfast, lunch and dinner, this café offers an exclusive selection of starters, main dishes and desserts on the buffet menu as well as à la carte. Grand Hyatt Muscat offers a range of versatile and contemporary meeting rooms totalling 1000 square metres of floor area, ideal for a variety of meetings and events from conferences and seminars to large seated banquets and intimate boardroom meetings or dinner parties. The hotel's Afrah Ballroom can seat up to 500 guests for a lavish banquet and is divisible into three separate rooms to host smaller meetings or events. A pre-function area, accommodating up to 200 people for cocktails, is conveniently located adjacent to the Ballroom. Three further meeting rooms, Habrout, Lubaan and Yashbum, cater for groups from 8 to 50, ideal for breakout and brainstorming sessions for large seminars and workshops, or boardroom meetings. The hotel's team of highly trained and experienced banqueting staff together with on-site audio-visual technicians is at hand to ensure your event is a resounding success. A choice of meeting packages that include coffee breaks, lunch and audio-visual equipment rental is also available at Grand Hyatt Muscat. Grand Hyatt Muscat is the perfect venue for your unique wedding. The hotel's elegant Afrah Ballroom can be adapted to suit any size of celebration and Grand Hyatt Hotel Muscat can tailor your day to your specific needs, ensuring your special day lingers in the memories of you and your guests. Add the unique Hyatt touch to your meeting or event at Grand Hyatt Muscat! The areas surrounding Muscat city are diverse in scenery and culturally rich. A haven for water-sports enthusiasts, Omani waters are home to some of the most amazing marine life in the world. Historic tombs, monuments and forts are easily accessed, and tours to the Wahiba Sands or Jebel Akhdar and Jebel Shams mountains are arranged through Grand Hyatt Hotel Muscat Concierge. Caving, hiking, abseiling are sports for which Oman is a great destination. Whether for adventure or for a relaxing break, Muscat has much to offer its visitors. Within the hotel, guests can enjoy Grand Hyatt Hotel Muscat pool and lazy river, play tennis or squash or use the gymnasium. Grand Hyatt Muscat has direct access to the beautiful beach of Shatti Al Qurm. Water sport equipment available on hire from the Boathouse - windsurfing, sailing, fishing, snorkelling trips, dolphin watching excursions, diving, PADI dive courses.